An Energy Performance Certificate (EPC) is a report on the energy efficiency rating of your home. 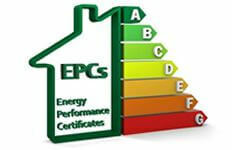 All buildings now require an EPC which is particularly important when you are buying or selling a home. As well as the energy efficiency graphs the report also makes suggestions for how to improve the property's energy performance, which will lead to reduced carbon emissions, lower energy bills and make the house more attractive to prospective buyers or tenants. An EPC gives the property a rating from A to G based on its energy efficiency. An 'A' rating shows it's very efficient, meaning lower fuel bills, while 'G' is inefficient, meaning higher fuel bills. The Certificate also shows the building's environmental impact by indicating its carbon dioxide emissions. For more information on Energy Performance Certificates in Preston call us on 01772 970170 or contact us online to book a survey. Whether you are buying, selling or renting a home the law now states that you need an energy performance certificate. TA Surveyors Preston have over 20 years experience and are RICS qualified independent Surveyors based near Preston Lancashire. If you are looking for a home buyers report, building survey, building & services survey or energy performance certificate in the Preston area call us today. We are one of the leading property surveyors in Preston and our team are fully trained to ensure expert home surveys in Preston at affordable prices.